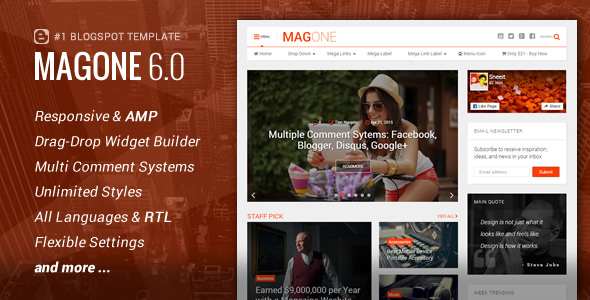 Free Download MagOne Responsive Blogger Template latest version 6.3.7 proudly designed and developed by Sneeit only on ThemeForest. MagOne v6.3.7 - Responsive News & Magazine Blogger Template has been released first on 14 July, 2015 and last updated on 14th January, 2018. It perfectly compatible with Firefox, IE8, IE9, IE10, IE11, Safari, Opera, Chrome having over 1,380 sales globally. Please follow MagOne Blogger Template overview below!